The Astros, parent club to Columbus-circa-1980 and newcomers to the American League, just redid their duds in a way that's nostalgic for Del Leatherwood's hat and 1960s Houston road uniforms. Gone are the silhouette star caps and back are capital letter serifs. What I don't see for 2013: design elements inspired by Houston's infamous 70s-80s disco astronaut look. Why do people today hate disco astronauts? 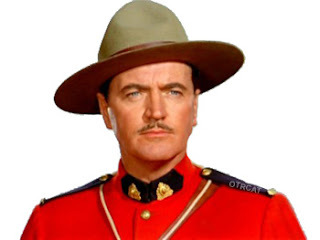 Speaking of classic hats, Delrick Leatherwood (Del's given name) sounds like a Yukon Mountie to me. I'm just saying he and Sgt. Preston might work well together. Leatherwood wore these duds in 1981 for the Tucson Toros, whose designers narrowed their palette to just warm colors one year after their bullfighter-themed fashion adventure nearly claimed "worst uniform ever" honors. 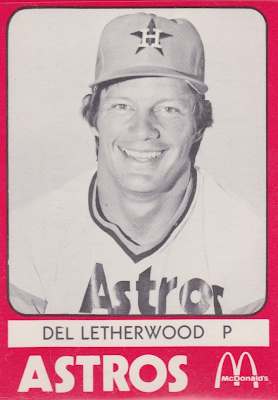 Leatherwood won 15 games for AA Columbus in 1979 and seemed ready to move up. He started even better in 1980, but ultimately finished with half the innings (career stats). I assume an injury stole much of that year and perhaps his career prospects, as Del retired after 1982. 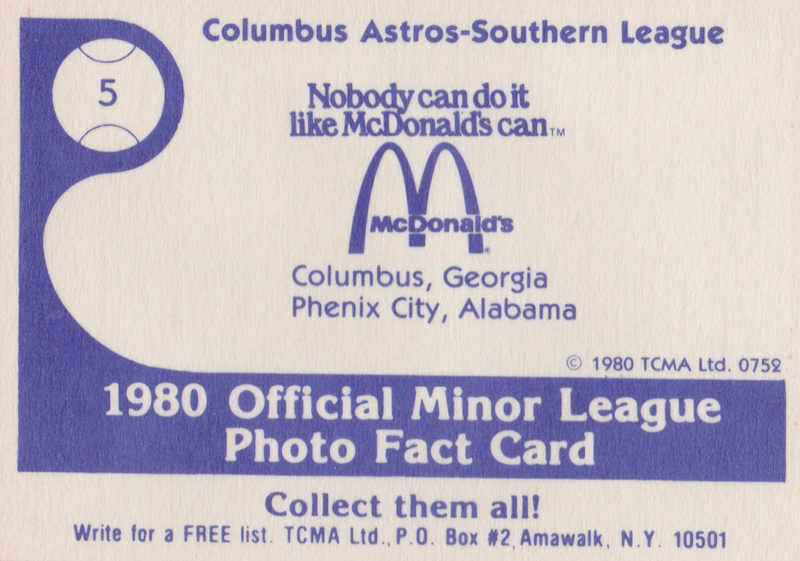 TCMA printed 22 Columbus players in 1980, including future Pirates and Angels speedster Johnny Ray. For the record, leather is the 3rd anniversary and wood is the 5th. Value: This #5 cost $2 at MinorLeagueSingles.com. Ray became well-known enough to push team set prices higher than many other TCMA issues at $25-30. Fakes / reprints: TCMA reprinted several 1980 team sets for "collectors kits" later in the 1980s. Those cards have black backs and the originals are blue. His first name and his last name were both spelled two different ways on those two cards. Good eyes. TCMA did indeed play fast and loose with spell-checking, even between similar sets.